The director of the ISD, Prof. Julian May, was invited by the National Research Foundation (NRF) to give a public lecture on "Poverty and Education in South Africa: Why do schools in poor communities underperform?" at the University of Johannesburg on 23 August 2012, together with Prof. Hoppers (University of South Africa). From 19.00 - 21.00 SAFM Radio was providing live broadcasts of the lecture followed by a roundtable discussion lead by SAFM presenter Mrs Masechaba Moshoeshoe. As one of the partners of the Development Research Division of the South African - German Centre for Development Research and Criminal Justice, the IEE together with the School of International Development (DEV), the International Institute of Social Studies (ISS), the Institute for Development and Peace (INEF) and the Institute of Political Science (IPS) is organizing the first PhD Conference on International Development. The conference will take place from 18 – 19 September 2012 in Bochum, Germany. The detailed schedule will be available here soon. For more information see "Program PhD Conference Bochum 2012". The deadlline for submissions of papers already expried at 16 July 2012! Applicants have been informed about the selection results. Deadline for applicants from Sub-Sahara Africa expired! The application deadline for Scholarships for the MA and M Econ in Development Studies, for the MA in Public Administration and for the PhD already expired. Publication of Prof. John Williams and DAAD Student K. Alatinga in the "European Journal of Business and Social Science"
Prof. John Wiliams and the DAAD PhD Student Kennedy Alatinga (co-author) published their paper "Does membership in mutual health insurance guarantee quality health care? Some evidence from Ghana" in the European Journal of Business and Social Science. The paper can be downloaded here. 15 students from 11different countries of the world take part in the 2012 Bochum Programme of Development Management at the UWC in Cape Town. Welcome and good luck! From 14 - 17 March 2012, Dr. Gabriele Bäcker and Britta Niklas took part in the network meeting of the DAAD Centres of Excellence (DAAD-magazine) at the Namibian-German Centre for Logistics. On 17th March 2012, the opening ceremony of the meeting took place in the Polytechnic Hotel School close to the campus of the Polytechnic of Namibia. During the Meeting the topic " Governance, Institutions and Legal Pluralism" was discussed in order to learn from each other´s experience in the management of the cetnres. We want t o welcome six new scholarship holders at the Development Research Section of our Centre at the University of the Western Cape. Whereas Coretta Jonah and Eria Serwajja are taking part in our phd programme, Grace Geletsu, Erik Mariga and Zororo Mavindidze are studying the MA in Development Studies and Kabaso Kabwe is studying the MA in Public Administration. The DRD offers DAAD merit scholarships for excellent students on the Master's (Master in Development Studies and Master in Public Administration) and PhD level. The next deadline for submission of applications is 31 July 2012. For more information see scholarship section and the information about study programmes at the DRD - here especially the "How to apply" part. 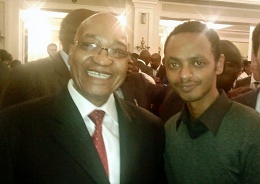 Two of o ur Master students, Winnie Sambu and Seyfe Tadesse, were invited to participate at the South African budget speech, which was held at the South African Parliament in Cape Town on 22nd February 2012. This gave them the unique opportunity not only to gain first-hand experiences in development policy issues but, in addition to this, to meet the South African President, Jacob Zuma, face-to-face!